Many people comment about how often we at Chosen Payments travel, why we do it, and whether we like it. We LOVE it. We love delivering the Chosen Payments message and spirit. As a company dedicated to very specific industries, we love sharing meals with our clients across the country. We love delivering educational sessions at trade shows teaching people how to slash their credit card processing fees, regardless of who their processor is. Today, we are packing up from the International Luxury Coach and Transportation Show, the world’s largest ground transportation show. We were proud to once again be a show sponsor, host our 6th Annual Legendary Party at the House of Blues, and deliver checks to state associations. 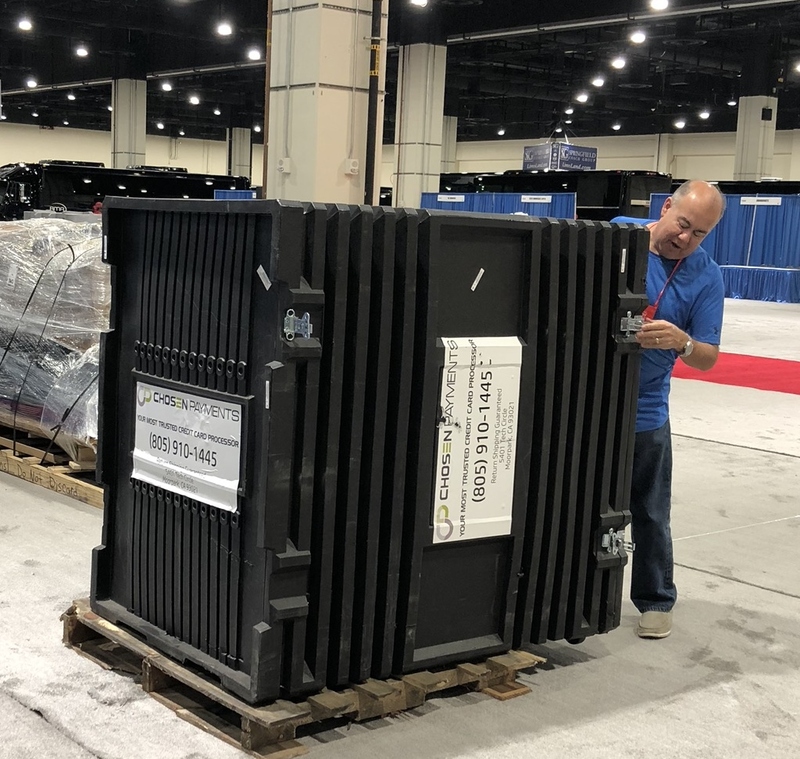 At the same time we had a crew on the ground in Las Vegas, another crew was participating in the American Moving and Storage Convention in Houston. That show is the largest moving industry show in the world. Our crate is now on its way to Charlotte, NC, where we are a sponsor of the International Cemetery, Cremation and Funeral Association. You can bet we will throw a party for our friends and clients in the funeral industry. From Charlotte we are heading to the beach of Southern California, San Diego. You’ll find us at the California Moving & Storage Show and then we’re heading to Austin as a sponsor of the Chauffeur Driven Executive Retreat, an educational summit for ground transportation operators. We consider ourselves to be a valuable member benefit to our association partners and their membership. Our White Glove Service is based on relationships that are built by sharing meals, cocktails, and good times. Our support and sponsorships of associations is our way of saying THANK YOU for your loyal business. We like to deliver those thanks in person. Does Your Credit Card Processor Help Your Business?